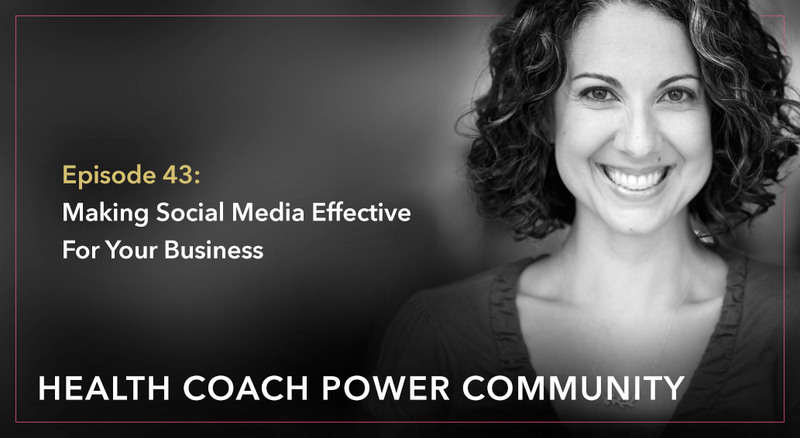 – Sets expectations around social media and shares her approach to Facebook, Instagram, etc. – Helps you get your legal documents created…the right way! – Recommends some great health/wellness podcasts to check out! Hey there, health coaches! Does it ever feel like you’re just wasting hours and hours and hours of your life on social media? I know I know the feeling. All the so called experts tell you that it is a must for building your business, but the question today is does it really work or is it a waste of your time? My name is Michelle Phennighaus. I’m a certified health coach with my own private practice as well as acting as a mentor for my fellow health coaches and I’ve been doing this for 10 years now. Usually we live stream these q and a’s, but today I just could not get the Facebook live stream to work, which is kind of ironic since we are talking about social media. So anyway, you should always have a backup plan. That’s my tip number one, but go ahead and if you’re watching this video later, give a like if you would like to be getting better results from using social media. And tell me in the comments, what’s your favorite social media platform? Today’s episode is brought to you by my free training for health coaches. It’s called how to double your mailing list in the next 90 days. And guess what? Social media is actually pretty important here. It can really help you out with list building. You can sign up for this free training at healthcoachpower.com/double. Just head on over there, sign up and the training is all yours. Okay, so, onto today’s main topic. This one came from Sarah and Sarah said, what type of return are you seeing from increasing followers on Instagram and Facebook? I’m finding Instagram takes lots of time with frustrating ups and downs and followers and I haven’t done much with Facebook yet. My clients have all been referrals and I’m wondering if it’s a poor use of my time working in Instagram or whether anyone is seeing short- or long-term return in adding clients through this media stream? So, it was a really smart question, Sarah. We always should be sort of auditing how we’re spending the time in our day. We only have x number of hours to work and if you feel like you’re wasting half of it on social media. My goodness, let’s do something else, so I just want to talk a little bit about how social media works for me in my business, how I see it working for others and kind of how you can know whether or not it’s working for you. So what I initially thought would happen with my business when I opened up my Instagram account or when I started using Facebook for business or whatever is I thought I was going to find clients and this is actually rarely the case, that there’s going to be a direct client acquisition where like you come across a brand new person that you’ve never met before, they’ve never met you, but you find each other via social media and then they contact you for a consultation and boom, sign up and you’ve got yourself a new client. That is, I’m just going to say, rare. So if that’s all happening for you guys, don’t worry. It doesn’t usually happen that way much more often. What I find to be the case, sort of whether you have met someone in person like at a workshop that you give or maybe it’s a friend or an acquaintance or somebody that you’ve met in real life or maybe you have met someone online regardless of how you met the people. I find that more often social media is a way of nurturing these existing connections and we have the ability to nurture these relationships across multiple channels where you can reach people on Facebook. We can reach people on Facebook live when it’s working, use people on Instagram. We can reach them on Pinterest. We can reach them on snapchat or whatever you’re using and that’s really great because I don’t know if you’ve noticed that people have very small attention spans, very small windows that they’re going to give you of their time. So if you are only reaching people through your email each week, so say you’re sending out an email to your list like clockwork every week. I mean that is great right there. That is a really great thing to be doing and we talked about email marketing in a recent past episode, but if that’s the only way that you’re reaching your audience, some people you’re just never going to reach because their inbox is so full, they never get to read yours or because they just automatically delete everything without opening it or because they’re just so busy that they miss it, but later on when they’re sitting on the toilet scrolling through Instagram, that may be when they actually catch you. And how amazing is that? So I find that the more channels we can be present on, the more likely we are to actually maintain a relationship with those who we have a relationship already. Um, so that’s kind of the way that I think about social media. It’s like, yes, I am acquiring new people into my world, but more importantly it acts as a way for me to build those relationships. And um, either way, however you find these people, however you’re nurturing them, whatever platform you’re on, whether you’re favorite is Instagram or Facebook or whatever, the most important thing that you can do is always be spending time on these platforms with an eye towards converting your fans and your followers to your own mailing list. And I talk a lot about this inside my course, healthy profit university because I find that time on social can be wasted, wasted, wasted time if you don’t have a strategy in mind. And what often works really well is to have someone that you are talking with, you’re commenting on, they’re commenting on your stuff. You know, whatever you’re showing up in their feed. If you can get that person onto your mailing list, well that’s great because now that’s another touchpoint you have with them, but also people are more likely to buy from email. Then they are likely to buy directly from social media. This varies a little bit from demographic to demographic, but you know, there is a saying for a reason, “The money is in the list.” So I always use social media as a way to gather my audience and convert them over to my mailing list and finally, Sarah and for anybody else wondering, some people just hate social media. They don’t want any part of it. Yeah. You know what? People have successful businesses long before the advent of social media. I had a successful business, I’m not going to say long before the advent because I suppose it had already been invented in a way, but 10 years ago we were not using social media the way that we’re using it today. I was hardly using it at all for my business and yet I earned money. My peers were earning money, we were all running businesses and we did it without Instagram at all. So no, it’s not necessary and particularly if you plan on being more of a local business that gets lots of referrals. If you’re going to be out in your community events, you’re going to be really working in the local scene. Maybe you have an office on main street, whatever it is. That really, I think, makes it less important for you to be active on social media. You’re going to be putting your efforts elsewhere, you know you’re going to be showing up for the street fair. You’re going to be working on building a relationships with all of the other practitioners and business owners on up and down main street or wherever you are. However, if you’re looking to compete in the online space, if you want to be working with clients worldwide like I do, then yes, social media is something that you may want to invest your time in, but as we talked about, don’t measure your success on how many consultations came in today through Instagram. It just doesn’t really work that way, so I hope that’s helpful, Sarah, and for anybody else that has been struggling with social media, if you know what you’re doing and have a strategy for how you’re using it, I find that the time is better spent and you don’t feel like, oh my God, what am I doing? Just posting another picture of what I ate for breakfast this morning. I didn’t even catch to change and make it into my own business name. Not to mention she probably had this stuff drafted by a lawyer has been in somehow modified to fit her business and here I am, I’m going to use it for mine. So that was definitely an amateur move on my part. Kayla, I want to tell you what I had actually recently done to up my game in the legal areas of business. Definitely not my area of expertise, no lawyer in case you couldn’t already tell, but there is um, a, an attorney and legal coach running is Lisa Fraley and she’s actually going to be joining us next week. So on December 13th, 2018, Lisa’s going to be joining us for an event to talk about how to practice legally no matter where you live in the United States. We get so many questions about this and part of that is going to be having the right legal documents completed for your business and available on your website. Okay. I got another question here from Michelle and she said I want to have one website that would be for the general public that can look at my services and see what I’m all about. I also want to have a website that would be member access only where they would pay a fee monthly to be part of it. Is that something I could do for my regular website with some sort of login criteria or is that something I would need to do separately on a different site? Well, again, I have some funny stories. A lot of these things are questions that I’ve asked myself through the years and since I didn’t have anybody to really ask other than myself, I often came up with some very strange solutions as I mentioned with my terms and conditions page. So Michelle, I thought I would just share with you some of my experiences. The answer is there’s a zillion ways to do this. There really are lots of different solutions for how you can have a member site with login access in addition to your own website. If we were having a one on one conversation, I would want to know more about this member site because it is a big investment of your time and energy, not to mention any money that you might spend to maintain something like that and you want to make sure you’re going into it with a strong strategy for success. But anyway, I will leave that for another conversation. The first time that I wanted to have a true logins sort of member only access on a website was actually for a course that I used to run for health coaches. Um, it was a sort of a beginner course and I needed somewhere to put my videos and my worksheets and I was, I wanted to have a true member site. So, at that time what I did was I bought a WordPress plugin and there’s lots of these out there. The one I bought is no longer around for good reason and uh, yeah, I’m sure you can find others. So, if you’re on WordPress in particular, I know there’s lots of plugins that do member access type functionality, um, and if you’re on Wix or Squarespace, my understanding is they may have this type of functionality as well. And so that’s what I did and it worked. It worked okay. But what I didn’t love about using my own website and my server for my member site was that it just made the backend of my website so much more complicated. And when one thing goes down, everything goes down. And that will happen with websites, right? Sometimes the website goes down, sometimes the server crashes. I know a very well known and lucrative, profitable, lucrative, like, you know, very successful health coach and she had her entire business shut down one day because of a mistake that an assistant made and the whole site went down. Not just her website, but her member site, her sales pages, she couldn’t make any money. She was running ads to pages that weren’t there. She had members that couldn’t access their stuff. It all went down in one big fire and that’s what I’m talking about or it can be a little bit tricky to kind of put all your eggs into one basket, so I stopped using that plugin because it didn’t have some functionality that I needed, but even if that hadn’t happened in retrospect, I can see that it’s. I like how my business is set up now where I actually have a website that sits on one server. I have a member site that is hosted by completely different company. I’ll tell you about that in just a second and actually all of my sales pages are lead pages and are hosted on lead pages. So my website could go down. I could make a mistake and erase my whole website and I have done that in the past. You guys and I could still be making sales because my sales pages lived somewhere else and my members could still be accessing their lessons, so what I’ve been using lately is a membership site called thinkific and if you want to check it out, you can go to findyourbalancehealth.com/think it’s a site that allows course creators to put up any kind of course that they want. I think it has a really nice design. It’s easy to use. It has a ton of features and integrations and it’s not terribly expensive. I thought that the way they have their membership breakdown made a lot of sense. Some of the others seemed way, way, way more expensive than anything that I want. I want it to pay for. So I’ve been very happy with thinkific. You might want to look into that and at the very least do look around for options where you can host your member site separately. And just to go back to my point about sales pages, again, I host mine on lead pages. You can get a lead pages account for just a couple of hundred dollars a month. No, not a month, a year, a couple of hundred dollars a year. It’s not very expensive. And then again, you’re not relying on the member’s site, you’re not relying on your own website to make sales. And that can be really handy as well. Lead pages you can find at, findyourbalancehealth.com/leadpages. Alrighty then, let’s move on. It’s funny because usually these Q&A are live, so I’m taking your questions as they come in today. I can’t talk to anybody so I’m just going on the notes that I had prepared in advance. Sorry about that. We will try to get this working again for next week. So here’s a question that came in from Rebecca and I think she posted this right before thanksgiving. She said, can anybody recommend a few I books to listen to while driving? I’m looking for something pertinent to health and wellness. Well, you came to the right place, Rebecca, because we’re all a bunch of health and wellness nerds, so I know you got some suggestions for different things to listen to. I have never listened to an eBook in my life. That sounds interesting. I should figure that out someday, but I thought, hey, this is a cool opportunity to just talk about some of the podcasts that I listen to religiously. I tend to be someone that subscribes to a podcast and I like just listen to those podcasts. I don’t hop around a lot. I’m very, very connected to the few podcasts that I subscribe to. So these are ones that week after week they’re putting out great content. I maybe don’t listen to every single episode, but I always look to see what’s their latest and I’m hooked. So the first one that I want to tell you about is called mastering nutrition. It’s by Chris Master John, and he puts out episodes that are really bite size, eight minutes, seven minutes. It’s great. And they’re very specific little topics like using vitamin a for allergies or knowing your zinc status or something like that. And you can just look at it and know right away if that’s something you need or something that you don’t and move on. But I love how quick and bite size they are. Lots of great information. Another one in a similar vein is the 15 minute matrix by Andrea Nakayama. I love this podcast because again, the episodes are on the shorter side, very succinct and they cover one specific topic in each episode and if you’re familiar with the functional medicine Matrix, that’s the idea of each episode is that they map a condition or they map something to the matrix, which is just. I just think it’s a really interesting creative way to go about doing a podcast. So I love that one. The 15 minute matrix. I also listen to Natural MD Radio. You may know I have talked about this before that I studied with Dr Aviva Romm last year and her professional training program. So, this is Aviva’s podcast, Natural MD Radio and I love listening to this because it works as sort of a refresher for a lot of the things that I learned in her program. It helps me keep it top of mind and maybe understand it in a new way because she’s just saying that a little bit differently or also on her podcast. She’s not getting quite so technical, so on the podcast. Often the way she explained something teaches me how I might explain it to else, so I love listening to this podcast. The only episodes I don’t listen to are the ones that are about pregnancy or natural birth and these are all things that were very relevant to me not too many years ago, but right now I’m not in that place in my life and neither are my clients, but if you are in the childbearing time of life, definitely check out this podcast for topics related to that and then another one, and this is a bit of an outlier because it’s not so much about health, but it’s more about mental health I suppose, and emotional health. It’s called Over It And On With It with Christine Hassler. Christine Hassler is a life coach and she’s got a great podcast, really well done. She mixes it up. Sometimes it’s an episode where she’s doing live coaching with a listener, sometimes it’s an episode where she’s doing an interview with somebody. It kind of changes and I’ve just found that to always be something worth listening to. So again, that’s called over it and on with it with Christine Hassler and I’ll put links to all of these in the show notes. Alrighty. I think I have time for one more question and I have this one here. Luckily I have it here since I’m not getting any questions live today. I always have some prepared though, and this is a good one. that came in from Allison. Allison said, I have a meeting with a potential client today. She’s been struggling with her weight since having a partial hysterectomy many years ago. She’s tried every diet under the sun and then some. She’s even gone to functional medicine doctors and gotten the whole workup. Thyroid adrenal hormones both told her that everything looks fine and she needs to accept her weight. If I had to guess something was off with her hormones and her metabolism is wrecked from the constant dieting, where would you go with a client like this? Let’s just all take a breath for Allison. Where would we go with a client like this? You know, Allison, it sounds like this client knows a lot, has done a lot. She’s probably read a lot of books. She’s tried all the diets. She’s even gone to two of these functional medicine doctors and that’s not cheap and now she’s working with you. I think it’s probably time to step away from protocols and I would go with this client where she wants to go because to me it sounds like she’s been listening to every piece of advice that she can get her hands on. I mean, and that’s a good thing, right? She’s been really working hard to try to solve her problem, but maybe it’s time to turn that around and start paying more attention to what’s going on inside of her and what she thinks and maybe this is a real opportunity to use your time coaching her to explore what does she think is going to help her? When does she think the problem lies? What would she like to try? What are her frustrations like? Allow her to have her own answers because often our clients do. You can come to them thinking, oh well this person needs to supplement with that or they need to get this test, but sometimes if you give them the space, a client will just out and tell you, I really need to sort things out between me and my sister. It’s been causing me so much stress. Okay. That sounds important. You know, you never know what’s going to come up when you allow somebody to listen to their own intuition and that to me, that to me is what’s going to make the difference for this woman. Not another protocol, not another set of supplements or eat this. Don’t eat that type rules, so Allison, I hope, I hope that helps. I hope that helps all of you who are working with clients and you think to yourself, I don’t know what to tell them. Just remember not your job as a health coach to know what to tell them. I’ll let that sink in, not your job to know what to tell them is your job to help your clients figure out what they want to do and how to go about it. There you go. I want to thank you all so much for being here. Obviously not watching live, but catching the replay or listening via podcast later and if you’ve been getting value from the show and all of the free content that I put out every week, please go ahead and leave a written review on iTunes. I would appreciate that so very much because that’s what I need to reach more coaches and keep doing this work. Also, we are now on Instagram, which is fitting considering the topic of the show. So if you go to instagram.com/healthcoachpowercommunity, please follow and I’ll follow you back. Thanks for being here. Keep asking great questions and I will keep answering them. See you guys next week.